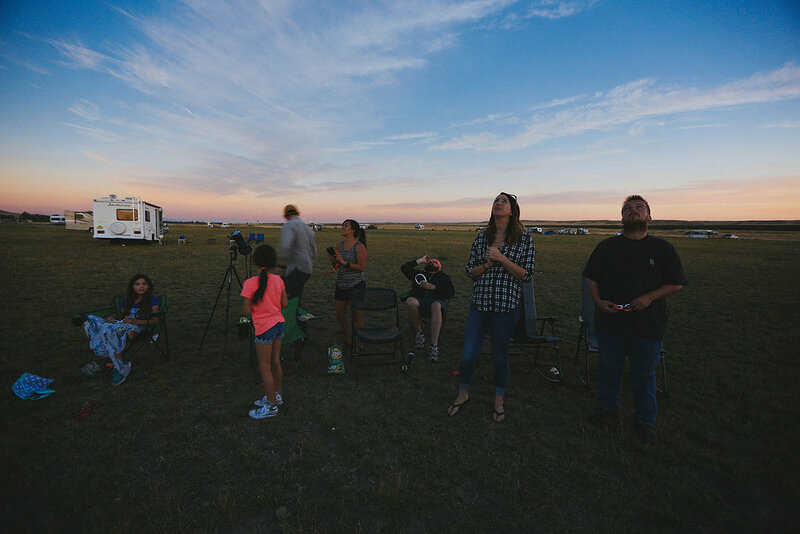 Finally got some time to download my DSLR photos from the honeymoon/eclipse/RV maiden voyage we set out on nearly two weeks ago. The trip was of course, wonderful, until the last 30 minutes of the drive home when Serenica's engine began stalling on us whenever we'd drop beneath a certain speed (hoping it's a minor fix!). Fortunately, after stalling out on several occasions and getting it restarted again, she died right inside our RV storage lot gate and wouldn't turn over. So there we were, only feet from our parking spot, stuck. So while we let it cool down, pondered a plan, and unloaded our stuff into my car, we gave it one more shot about 20 minutes later and it finally turned over and stayed on until Mike was able to back it into our spot. Considering the fact that we hadn't even really had someone look at the engine before we left on this journey, I think we were pretty lucky. If I'm being honest, I think Serenica was looking out for us. She very easily could have died in Wyoming, hours and hours from home, or equally worse: could have stalled in the middle of I-25 during Denver rush-hour traffic, as she almost did on our ride home, but she didn't. She got us home. Barely. Anyway, the real purpose of this post is to share the photos, below. The first gallery is our first day, setting out on the journey, our little plot of land, and our envious view of that day's sunset. We found this spot on Craigslist. A really sweet guy owns a nice big plot of land in rural Wyoming, just outside Glenrock. He had about 10 hook-up sites but was charging quite a bit to hook-up for the eclipse so Mike and I just reserved a boondocking spot instead. We shared this land with somewhere between 25-50 other rigs (I never officially counted), which, for the most part, the owner graciously spread all out around the perimeter (which can be seen in the photos below). Our closest neighbors were actually right behind us, in the hook-up sites, but since we're weren't facing them they were hardly noticeable. Immediately proceeding the eclipse more than half the rigs sharing the huge plot of land in front of us bailed, and by the next morning aside from 2-3 other motorhomes we were the only ones left there (and there were maybe 3 rigs left behind us hooked-up). By that evening we were the only ones left on our plot of land and there were maybe 2 more behind us hooked up. The owner of the land very generously offered to let us hook up our last couple days there and we accepted his offer., and spent the last day without the fear of running out of water or power (best shower ever!). By the time we'd left, Thursday 24th, there was only one other motorhome on the property. I so did not want to leave. Our friends, Adam, Amanda and Mat and their kids, Sophie and Nina decided last minute the evening of August 20th that they were going to drive up and join us. They arrived after midnight, set up their camping gear, and we all, exhausted, crashed for the night. 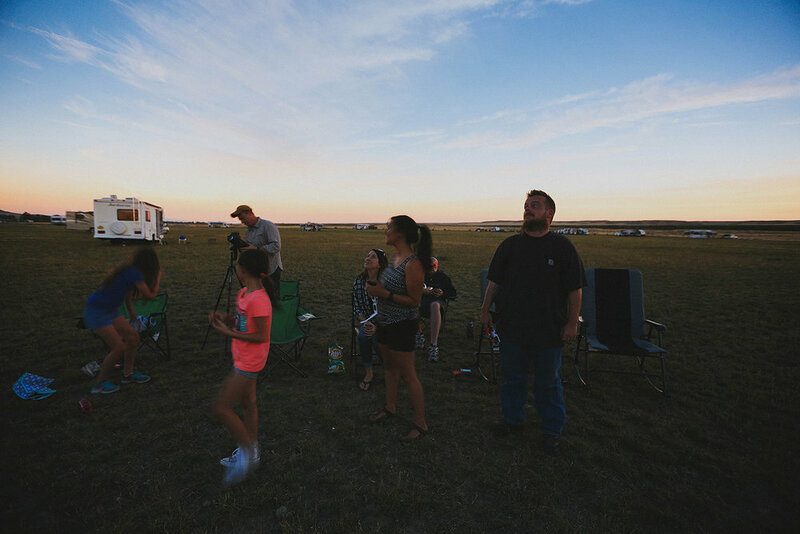 The next morning began with coffee, breakfast burritos, and eclipse preparation. The last photo in this particular gallery, of Amanda and her girls with their eclipse glasses on is one of my favorite photos from this trip. Actually, what I love about most of these photos is how great they'll be in 50 years. 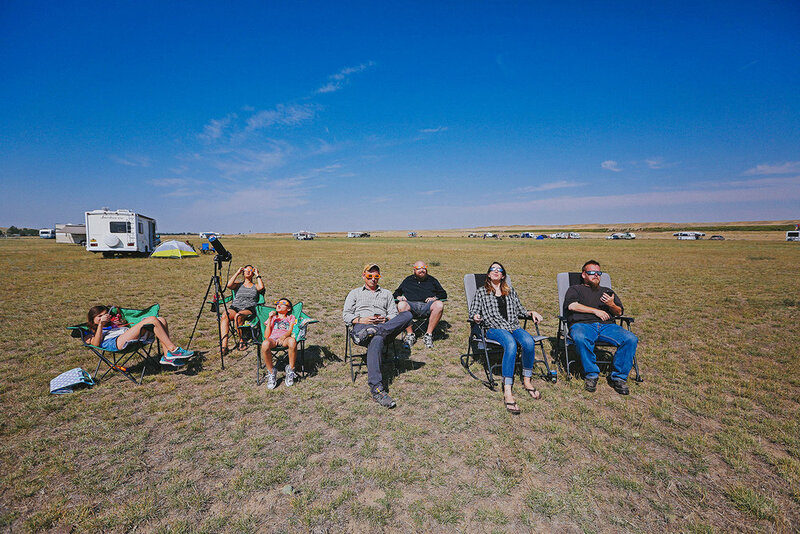 While everyone else was excited to capture the actual eclipse, I was more excited to capture my husband and friends eagerly awaiting and then watching the eclipse. 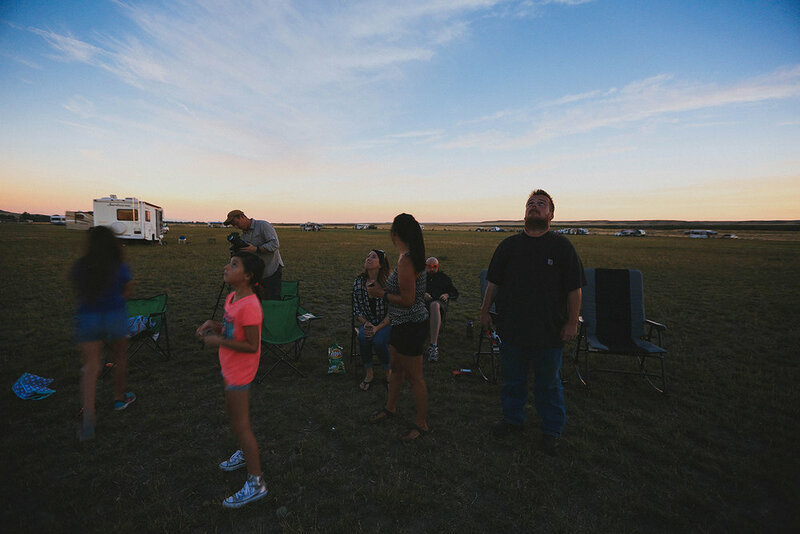 I knew thousands (hundreds of thousands) of people would be photographing the eclipse, and I didn't have a sufficient lens to do such a magnificent thing justice anyway, so I did what I do best: photographed the people instead. I actually wanted to create an animated GIF out of the images below but there were too many and the file was too large. But I promise you, if you hit the right arrow quickly enough, it'll feel stop-motion animated! (I imagine this is only really possible on a desktop). I set my camera up on a tripod and clicked the shutter using a (finicky) remote. You can see the clouds above us moving, and then it inevitably getting darker and darker until totality. 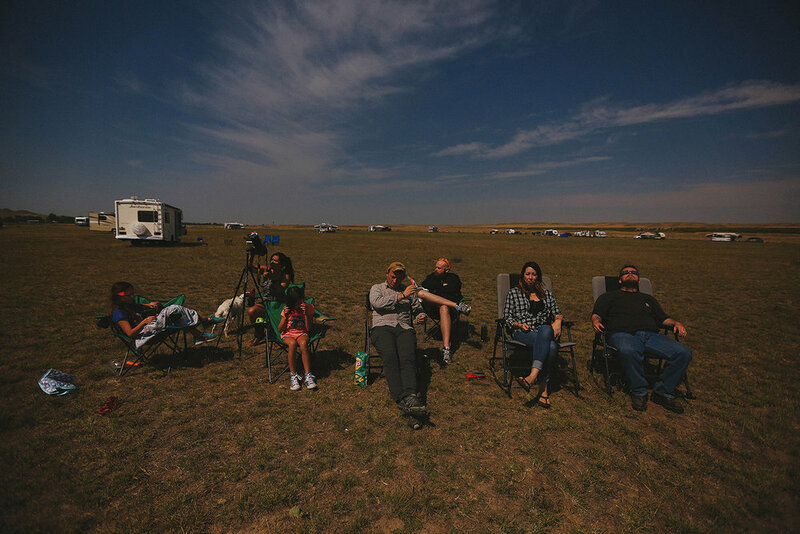 To truly appreciate how dark it got during totality, see the image just below this gallery, I posted it separately. Again, this experience was indescribable. I'm so grateful we made this trip. Right as totality hit, I made the split second decision to change the settings on my camera, and open the shutter so we weren't all in the dark for the next 2 minutes, although now I'm kinda wishing I would have left the settings alone, just to help illustrate how dark it was and for how long. 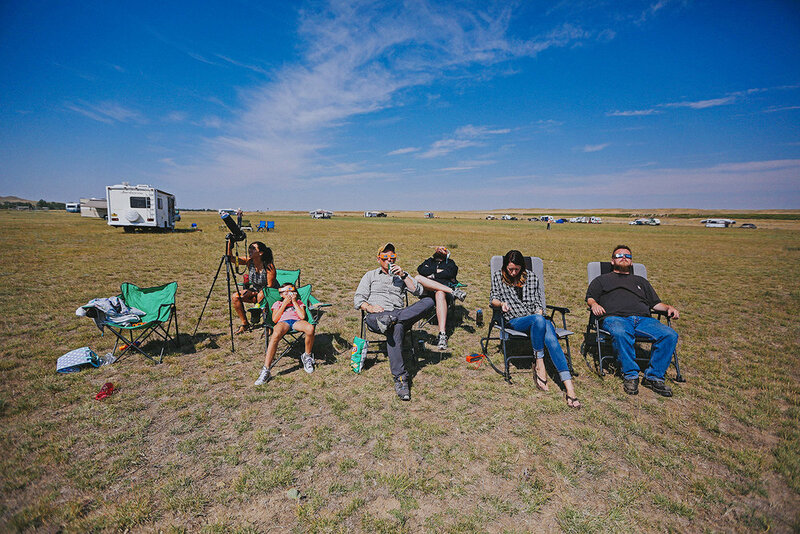 You'll notice the photos in this gallery get lighter at the end, as the sun is emerging from its place behind the sun and everyone puts their glasses back on. After the eclipse, Amanda, Sophie and I changed into our bathing suits and swam in the North Platte River. (Sophie was a little squeamish about well, nearly everything in that water which had Amanda and I laughing). Mat, Adam, Mike, and Nine stayed behind to grill burgers. Both Adam and Mat had to return to work the next day so they left to head back down to Colorado Springs right after lunch (and then got stuck amongst the thousands of cars all also heading home, and what should have been a 5 hour drive became an 11-hour one). Sometimes, if I want to share something but the feelings or emotion or experiences bound to that something feels like an insurmountable task to articulate or describe, I'll forgo doing so simply because I yearn to do such things justice, and grasping at words that can only communicate half truths or describe these somethings in desaturated hues feels wrong. I have always been an all or nothing girl, after all. I must make an exception for today, as well as yesterday when Mike and I set out for our first journey in Serenica. Indeed, to describe this experience thus far feels insurmountable. The drive was lovely and drama-free. Serenica did wonderfully. The big beautiful plot of land she sits on here in this rural and empty patch of Wyoming could not be more perfect. With our nearest neighbor at least 100 yards away and a winding river a few steps east, I feel grateful to have found it. 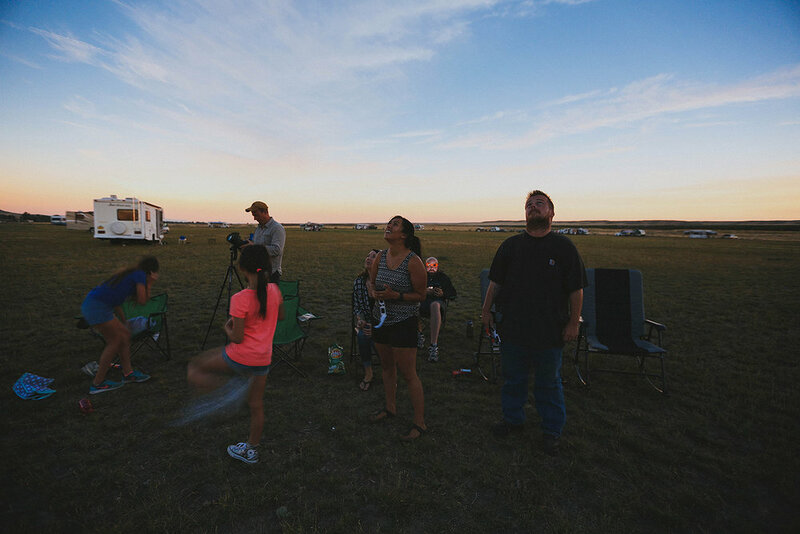 And when "friends" (a technicality as they're very much family) decide at the last minute to drive 5 hours north and arrive after midnight last night, camping gear and kids in tow, because they wanted to watch the eclipse with us, I realize life could not be more perfect. The eclipse was absolutely breathtaking. Feeling the temperature drop quickly, basking in the surreal dimming light as this part of the earth slowly became shrouded in silence and daytime darkness was the most powerful and profound natural phenomenon I've ever experienced, and to know I was fortunate enough to experience it with the people closest to me was perfect, probably more perfect than I deserve. And now, for the rest of this journey, I look forward to spending quiet alone time, here in this vast and empty space with deafening quiet and stars for days with my husband, a man who is also more perfect than I deserve, and we'll finally get to read each other the wedding vows we didn't have time enough to write before our hurried and last-minute marriage almost four months ago. Mike and I were then on our own. We spent the rest of our stay relaxing, sleeping, reading, watching movies, swimming in the North Platte River, cooking, listening to podcasts, experimenting with some night photography, and finally, reading each other our wedding vows, which can be read below. It was perfect. All of it. I honestly can't remember the last vacation I had that involved truly doing nothing and just...being. Since we didn't have an actual wedding, I thought it'd be nice to share our vows here for any loved ones who might want to read them. It's worth noting that because we didn't have a wedding, and I knew only Mike would be hearing these, I was bit more raw and candid than I would have been had I been reading them aloud in front of an audience. With that said, some parts have been redacted in my desire to keep them private because they're either too racy for public consumption and/or just because I'm not comfortable sharing publicly. I should note that we read these aloud to each other at night sitting under the stars, and I cried the entire time. I promise my love for you, now, is bigger than this world, this magical terrarium suspended in the endless flickering diamond dark. I promise my love for you now, is bigger than it's ever been. I promise that, by our 25th wedding anniversary, our galaxy will be saturated in my love for you. I promise that, at the close of our lifetimes, my love for you would have stained the entire universe red, all matter dripping with need for you. I promise to remain by your side through every forest, across every desert and every ocean, every mountain, every happiness, every peace and every war, every loss and every sadness, every pit of despair that threatens to consume us. I promise that if you're sinking, I will summon the fear of every moment I won't get to spend with you to save you. I promise that if I fail, I I will not let you go alone. I promise to celebrate every success, every achievement, every milestone, every sentimental day. I promise to relax. I promise to keep our home clean if you get the groceries. I promise to love every new freckle, and wrinkle, and scar, every bump, every mark, every blemish. I promise to always save you the last bite of cake. █ ███████ ██ ██████ ████ ███ ████. I promise that if I can't, I will help find you a girl who can. █ ███████ ██ ██████ ████ ████ ████, ███ ██ ████ ██ ███ ████ ██ ████. I promise to never stop trying to be beautiful for you. I promise to exist always in the present with you, except for the moments we're dreaming of the future, or making peace with the past. I promise to love every monster of your past, every heartbreak, every near-defeat, every victory. I promise to hug you every day, and rest my lips on yours. █ ███████ ██ ███ █████ ████████ ███, reach every high with you, take every trip with you. I promise to always be grateful for you. I promise I will never take you for granted. I promise I have loved you since I was 16 years old. I promise I still lament those first 16 years I knew not of your existence. █ ███████ █ █████ ██████ ███ ██ █████ ████ ████████ ██ █████ █ ███, ████ █ ███ ███████. I promise you I will spend the rest of my days making that up to you. I’ve never believed in fate. All the things that are possible, all the paths we could take, everything seemed far too random for me to place any faith in the idea that things are meant to be. And yet, here, in this reality, this universe, on an atom-sized ball in a system spinning on the edge of a galaxy amongst innumerable others, at exactly the right time, I found you. Any number of things could have stopped me from sitting at that electric box and an infinite number of other lives could have been lived. But in this one, I found you. The chances of not only finding you, but finding myself WITH you in that same life, are astronomically small. 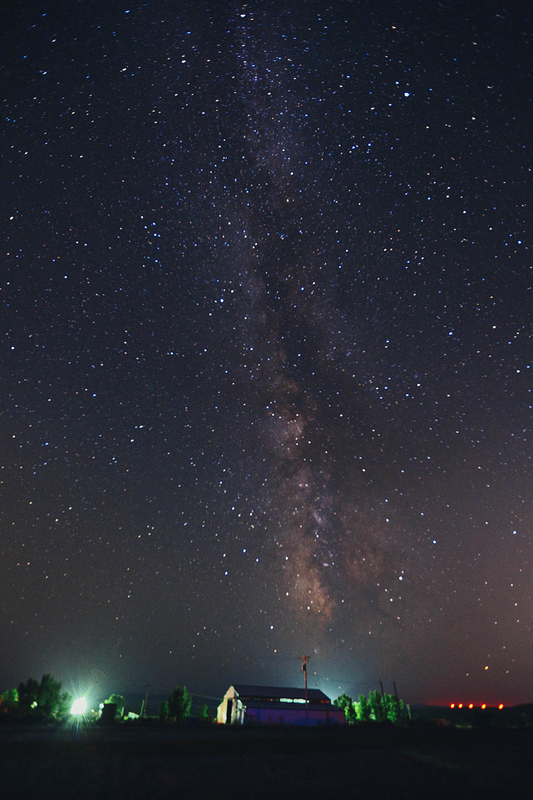 Infinitesimally tiny, like this grain of sand we’re riding on compared to all else that exists. And here we are. Impossibly. I don’t get it. I don't understand it at all, other than to think that maybe things can be meant to happen. That things can be destined to. 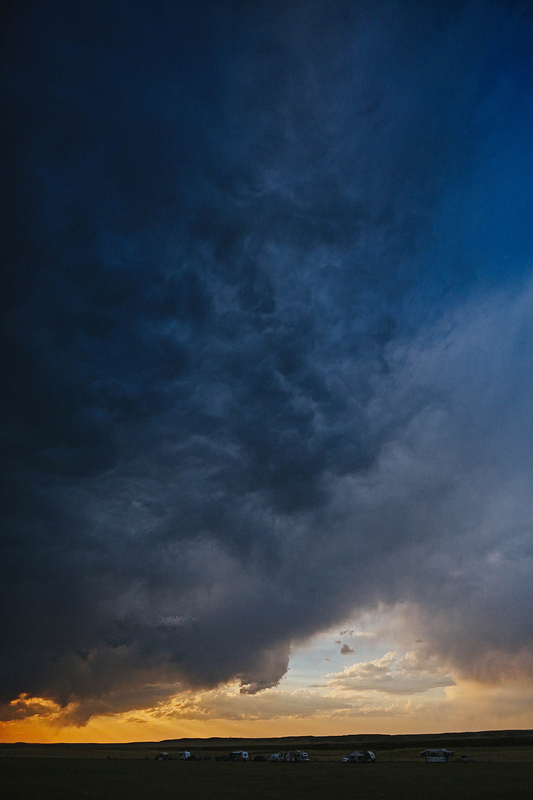 That fate maybe does exist, and it can be as perfect as the moon and sun intertwined in the sky. I found you here and now. I won't ever lose you. I won't ever let you go. I will do everything and anything to remember that, and show you. Thick and thin, poor or rich, sad or as happy as I have been, as happy as you've made me. 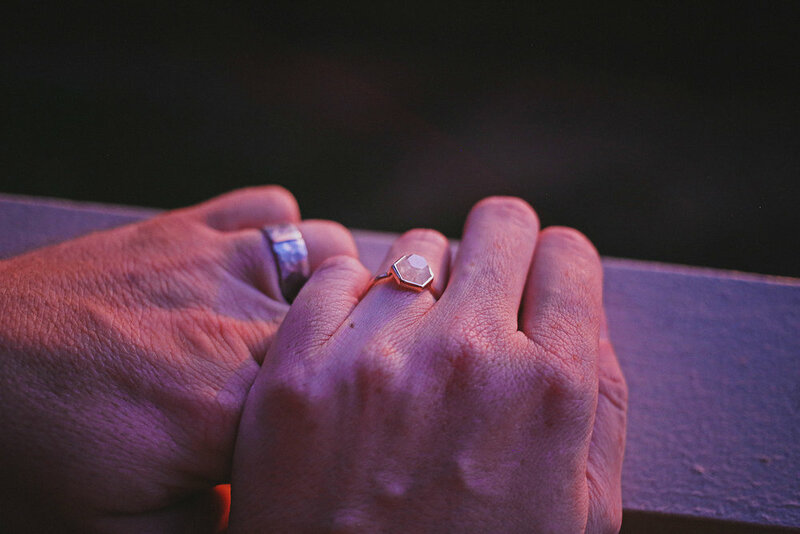 And finally, I wanted to share our wedding rings. Each were ordered from two separate independent artist/jewelers we found online. Mike's is palladium metal, texturized and indented with constellations and a rose gold strip. Mine is rose gold with a hexagon-shaped moonstone. Maybe someday, baby, we'll get off this rock.